We had a demo Sport 1000 which I was patiently waiting to clock up 1,000km when a fellow walked in and proclaimed himself the Australian Zard importer, so we did as you’d expect and kept the Sport Classic system he’d bought in for ourselves. Once we were up to 1,000km we did the first service, took it to the dyno for a base run, fitted the Zard and then did some tuning. It’s rather loud, especially when you’ve got it pinned, but quite quiet when you’re cruising around. On overrun it has one of the wackiest notes I ever heard. I was hoping for a nice Bwooooooorr, the sort of thing you get from a Pantah with a Gianelli 2-1. But it’s loud and kind of poppy, but not really and not backfiring. It’s rather hard to describe. Plus you get it as you shut the throttle for gear changes, so as you cruise up through the gears you get the vroooooom  baw  vrooooom  baw  vrooooom effect. It’s a rather cool bike to ride. Ian, one of our sales men, often leaves his new R1 at work and rides the Sport 1000 home, just because it puts such a smile on his face. When I first sat on it I found it very heavy on my wrists, but after 5 or so minutes riding I totally forgot about that, so it’s a bit deceptive ergonomic wise. Fits my body just great. Now, on to the all important dyno runs. Std the bike made 80 hp, about 5 less than one of our previous 1000SS demo’s (the less powerful of the two demo’s I’ve dynod) and around a consistant 10% down through most of the RPM range. Adding the Zard system helped the midrange, but started to hurt the top end a little, maybe due to the lack of a flowing crossover. Not really the result I was expecting, but it’s always nice to be presented with a challenge. Green is all std, red is Zard fitted with no other mods. For comparison an all std 1000SS is blue. Next is torque and air/fuel, without the 1000SS. This graph shows three curves, being so I can show the air/fuel curves from the muffler of the before run and for both cylinders with the Zard fitted. Although to some extent, the horizontal air/fuel may be influenced by the vertical. This is because the connecting pipe between the two headers could only flow from vertical to horizontal. It leaves the vertical header at right angles on the outside of a 180 degree bend, but enters the horizontal header almost parallel to the direction of flow. Green is all std with air/fuel from the muffler, red is horizontal with Zard, blue is vertical. I tried to get samples from the headers with the std mufflers, but that didn’t work as planned. If you’ve had a look at the air filter setup on a Sport Classic you’ll know how restrictive the inlet is and that the filter itself isn’t much better. If you haven’t, see the photo below. That little square opening arrowed is the air inlet! The filter is a round style, probably 60mm diameter and 180 or so mm long (that’s a very rough guess, made sitting in the lounge room tapping away on the laptop several weeks after looking at the filter). Thinking about it now, I guess a single 60mm hole feeding a bike with 45mm throttle bodies isn’t that bad, and the airbox is quite large in volume. But the inlet is still much less flowing than an SS or Monster with an open lid. So I did the obvious thing and attacked the air filter lid with a cutoff wheel. (as you do), photo below. The next photo shows the little passage that passes for the std air inlet  it’s about 20 - 25mm square and stays that way for maybe 100mm before reaching the filter. After hacking the lid there’s a round hole about 60mm or so. So you’d expect it to help. It’s much easier to see once you’ve hacked the bit above the filter off. We were still using the std filter, with a BMC filter to fit on order at that point. I have some photos somewhere that I couldn’t find while writing this report, but I’ll try to dig them out. The graph below shows the result  green is std lid and Zard, red is hacked lid and Zard. The jagged shape of the curve at higher RPM often gives an indication of leanness, as is the case here. The power is much better though. The air/fuel change for the horizontal cylinder was rather minor, which rather surprised me as below. Next I fitted a Dobeck add on box to see how much some more fuel helped things. To the above graph I’ll add the run for the Dobeck with the trim pot set to 11 (max) for the horizontal cylinder in blue. As you can see, it liked the fuel. Power first, and then air/fuel. I didn’t run the vertical air/fuel with the hacked lid and std fuel  the only run for the vertical is with the Dobeck box set to 11. This gave a very similar curve to the “Zard with std lid” curve, just a few % richer in places. The next graph shows the air/fuel result of the hacked airbox lid and Dobeck fitted (set to 11) for both cylinders compared to the std airbox and ECU. Green is horizontal std, blue is vertical std. Red is horizontal with hacked lid and Dobeck at 11, yellow is vertical with hacked lid and Dobeck at 11. 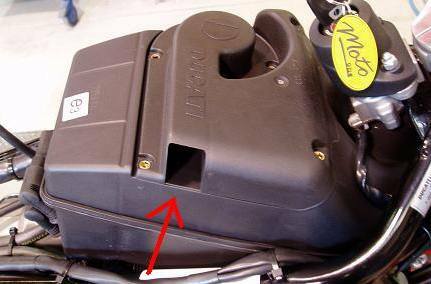 The very small change in the vertical cylinder trace I don’t really understand, unless the vertical is effected (leaned out) more by hacking the airbox lid. I guess it could be. And overall it could do with even more fuel than the Dobeck is capable of providing, although these twin spark engines seem to handle a little leanness better than the single spark 2V do. The next graphs show the start and finish - all std in green and Zard, hacked airbox lid and Dobeck (set to 11) in red. From 3,700 to 8,000 RPM it’s at least 7hp better, with an extra 9 from 4,500 to 5,500 RPM. In percentage terms that’s 15 to 20% in the bottom and midrange with 7 to 10% above that, a very sizeable increase. The torque graph following the power graph shows this very clearly. 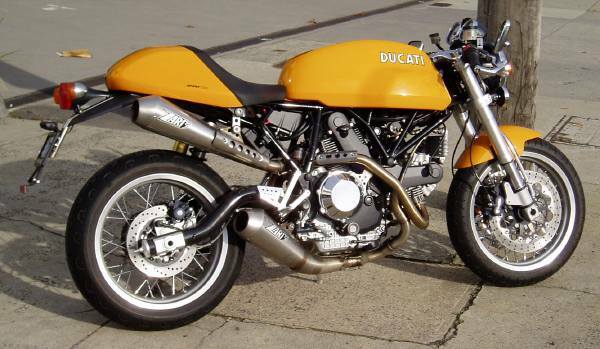 Overall, the exhaust, airbox and fuel mods have made a big difference to the Sport 1000. The following graph shows the difference in dyno roller acceleration time from std in green to all the mods in red. Both these runs were done under near identical environmental conditions, so they’re very relative. It feels much better on the road for the mods too. And, if you owned it, you’d also run a 14 tooth front sprocket at the least or change both front and rear from the std 15/38 to 14/40 or 15/43 for even more improvement. For comparison to the 1000SS, the final graph adds the two 1000SS I’ve dyno with slip on mufflers and open air filters to the above before/after graph. The Sport 1000 is still lacking at the top end, but as the under 5,000 RPM section is the same we can safely say it’s being restricted by flow in or out (what a wonderfully all encompassing and completely obvious statement huh), which we kind of knew anyway. I also developed a map for the Ultimap U59 ECU, and although the WOT fuelling is richer than the above with the U59, power output is the same. So there’s no point with another graph. The U59 doesn’t use the Closed Loop system or the idle speed motor, running in normal Open Loop (so you can remove the Lambda sensor) and requiring the idle speed to be set via the air bleeds screws like the 1000SS or 1000M. Likewise, you need to set the idle mixture using the U59 idle trimmer as per usual. Cold start really didn’t seem to be an issue without the idle speed motor (which gives the faster idle speed when cold), as you can adjust the ignition advance with regard to engine temperature on the U59 ECU independent of the sparkignition advance map, and this seems to handle cold start just fine. Once past the first 5 seconds I didn’t have any hassles, even on cold winter mornings when I’d ridden the bike home and left it outside all night. I did try putting a fast idle lever of sorts on the throttle bodies. I removed the idle stop screw on the RH side next to the cable wheel and fitted a bolt with a little lever on it. Set up so that it would only unscrew as far as the original idle mV setting, and would wind in about three quarters of a turn. The idea being that you’d wind it around to give a fast idle and back to give the original idle stop. The shape of the little lever needed a bit of work to clear enough stuff to give the required amount of turn to make it worthwhile and I sort of gave up after the first attempt because it didn’t really need it, but there’s certainly a possibility there if you felt so inclined. Also, some thoughts about disconnecting the idle speed motor. For those who don’t understand what I’m talking about, this is just an electronically controlled stepper motor with variable valve assembly that lets air bypass the throttle blades to give the idle speed the ECU deems appropriate for the engine temp at the time. More air bypassed equals higher idle. It must be easier or cheaper than having a variable throttle stop, especially when you’re running opening and closing throttle cables as the Sport Classics and S2R (I think) are. Given all this stuff is car based anyway and that’s what the cars use I expect that’s why. 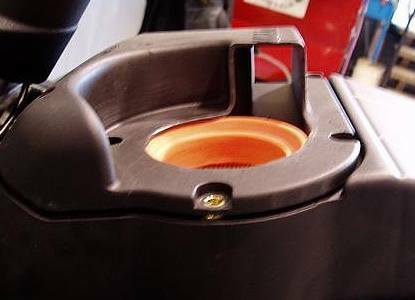 The idle speed motor runs through a stop to stop (fully open then fully closed I expect) procedure every time the ignition is turned on  you can hear it whirring. This lets it then set the base setting for any given engine temp, which it does by opening the valve a set number of steps from fully closed. The air bypassing the throttle blades is then accounted for by the ECU as it knows the relationship between valve steps from fully closed and air flow and how much fuel it needs to add to keep the mixture correct. Actually, this relationship is also variable with manifold vacuum (not measured), but I guess they ignore/fudge/guess to allow for that. So, if you were planning on unhooking the idle speed motor to make it stop doing stuff, but leaving the hoses connected you’d want to get the engine hot and idling and then pull the connector. That way, the motor valve setting will be as it should for hot idle and will stay there. 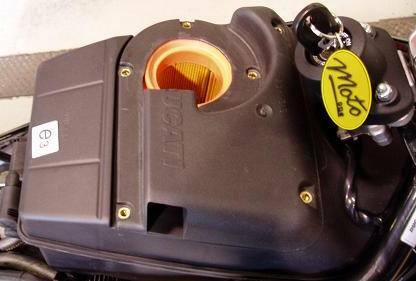 And, given the idle speed motor is on the bottom of the airbox and would be an unfiltered hole if it was open, this would be worth doing also if you did as I did (see below). I bypassed the idle speed motor completely by removing the hoses that go from it to the throttle bodies (or inlet manifolds, I forget now). But then I did something that caused problems. And to make it worse, I did it twice because I forgot what happened the first time around when playing with it the second time. What I did was to run a hose between the two throttle bodies. Harmless enough you’d expect, but it caused a really ratty and dirty idle (lots of oxygen and hydrocarbons) that was impossible to adjust out. Sent me spare the first time it did, and then the second time I was getting really stressed until I remembered what happened previously. Then I was just really annoyed with myself. So what I ended up doing was pushing a ball bearing into the hose, effectively blocking it. At which point the idle went back to normal and I adjusted the mixture and speed using the air bleeds and idle trimmer. I have no idea why this happened. You could also put some sort of blanking cap over the hose barbs on the throttle bodies, but I didn’t have any that fitted well.